Arthur E. Fette was born on 26 March 1892 at Beecher, Will, Illinois. He married Henrietta Mathilde Justine Grages, daughter of Friedrich Heinrich August Grages and Sophia Maria Catharina Louise Anna Fiene, circa 1929. 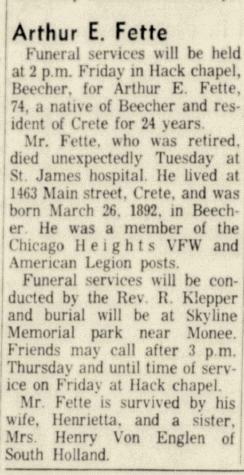 Arthur E. Fette was buried in 1966 at Skyline Memorial Park, Monee, Will, Illinois. He died in 1966 Arthur Fette obituary. 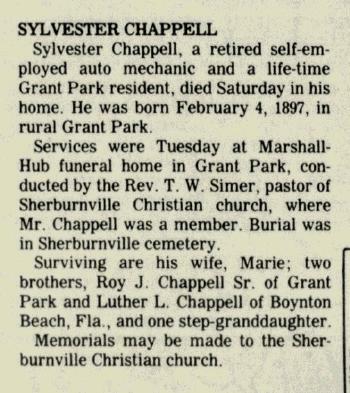 Sylvester Chappell was born on 4 February 1897 at Grant Park, Illinois. He married Maria Sophie Catherine Caroline Grages, daughter of Friedrich Heinrich August Grages and Sophia Maria Catharina Louise Anna Fiene, on 16 October 1943 at Kankakee, Illinois. 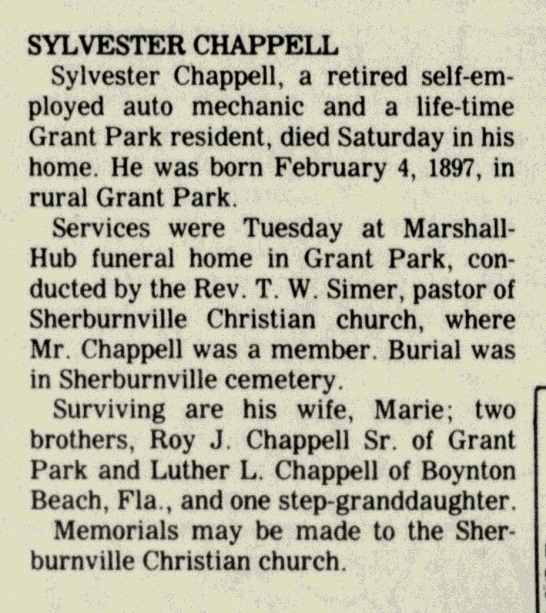 Sylvester Chappell died in June 1981 at Grant Park, Illinois, at age 84 Sylvester Chappell obituary. (?) Rosenbrock married Emma Stoeven, daughter of John Stoeven and Doras (?). John Stoeven was the son of John Stoeven and Doras (?). John Stoeven died after 1973. Sandra Joyce Michaels was born before 1960. She was the daughter of George O. Michaels and Edna Stolzenbach. In March 1961 at Cook, Illinois, attended Sandra Joyce Michaels confirmation celebration. Married Name 21 June 1952 As of 21 June 1952,her married name was Hall. Marjorie Flickinger was born before 1934. She was the daughter of William Flickinger and Meta Stolzenbach. Marjorie Flickinger married Robert Hall on 21 June 1952 at Crete, Will, Illinois. In June 1952 at Illinois attended Marjorie Flickinger bridal shower. On 21 January 1968 at Steger, Illinois, attended William and Meta (Stolzenbach) Flickinger 40th wedding anniversary celebration. Robert Hall was born before 1934. He married Marjorie Flickinger, daughter of William Flickinger and Meta Stolzenbach, on 21 June 1952 at Crete, Will, Illinois. Willard H. Flickinger married Iris June Allen. Willard H. Flickinger was born on 9 January 1931. He was the son of William Flickinger and Meta Stolzenbach. Willard H. Flickinger died on 12 September 1997 at age 66. He was buried after 12 September 1997 at Skyline Memorial Park, Monee, Will, Illinois. Married Name Her married name was Owens. Married Name Her married name was Owen. Marion Flickinger was the daughter of William Flickinger and Meta Stolzenbach. Marion Flickinger married Glendell Owen. Name Variation Glendell Owen was also known as Owens. Name Variation Glendell Owen was also known as Glen. Glendell Owen married Marion Flickinger, daughter of William Flickinger and Meta Stolzenbach. Married Name October 1959 As of October 1959,her married name was Hogeveen. Carol Jean Flickinger was born before 1941. Carol Jean Flickinger married John J. Hogeveen in October 1959 at Illinois Carol Jean Flickinger and John J Hogeveen marriage announcement. Name Variation John J. Hogeveen was also known as J. J.
John J. Hogeveen married Carol Jean Flickinger, daughter of William Flickinger and Meta Stolzenbach, in October 1959 at Illinois Carol Jean Flickinger and John J Hogeveen marriage announcement. Name Variation Iris June Allen was also known as June. Married Name Her married name was Flickinger. Iris June Allen married Willard H. Flickinger, son of William Flickinger and Meta Stolzenbach. Iris June Allen was born in 1928. She was buried in February 2005 at Skyline Memorial Park, Monee, Will, Illinois. She died in February 2005. Married Name Her married name was Ogden. Elaine Flickinger was the daughter of William Flickinger and Meta Stolzenbach. 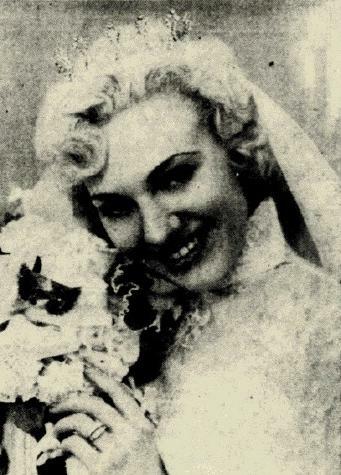 Elaine Flickinger married Robert Ogden. Robert Ogden married Elaine Flickinger, daughter of William Flickinger and Meta Stolzenbach. Married Name Her married name was (?) McCabe. (?) Farley was the daughter of John Farley and Margaret Dwyer. (?) Farley married H. J. McCabe. (?) Farley died after 1950. H. J. McCabe married (?) Farley, daughter of John Farley and Margaret Dwyer. H. J. McCabe died after 1950. Jack Burmester married Virginia M. Klitzke, daughter of Reinhold Klitzke and Emma M. (?). Jack Burmester died after 1972. Kenneth Klitzke was the son of Reinhold Klitzke and Emma M. (?). Kenneth Klitzke died after 1972. Bernard F. Dalsing was born in 1908. He was the son of (?) Dalsing. Bernard F. Dalsing married Luella D. Kaiser, daughter of John B. Kaiser and Mary Weber, on 15 January 1930. Bernard F. Dalsing was buried in 1980 at Immaculate Conception Church Cemetery, Kieler, Grant, Wisconsin. Ben C. Edge married Leona K. Meudt, daughter of Jacob Meudt and Lena Larson. Ben C. Edge died before 1972. Francis Stude was born on 28 December 1917. He married Ramona F. E. Meudt, daughter of Jacob Meudt and Lena Larson, on 5 February 1953. Francis Stude died on 15 March 2011 at age 93. Linus Loeffelholz was born on 27 February 1927. He was the son of Charles Loeffelholz and Emelia Salzmann. Linus Loeffelholz married Darlene Vondra on 27 June 1951. Linus Loeffelholz died on 30 April 2016 at age 89 Mr. Linus Henry Loeffelholz Sr, age 89, passed away on Saturday, April 30, 2016 at Heartsong in Belleville, WI. He was born February 27, 1927 at Dickeyville, WI. The son of Charles and Amelia (Salzman) Loeffelholz. On June 27, 1951 he was united in marriage to Darlene Vondra. Linus was a farmer and truckdriver. He was an excellent handler of mule teams. Linus is survived by his children; Sandi Loeffelholz of Tomah, WI, Rita Rankin of West Union, Iowa, Gail (Lawrence) Rose of Greenwood, WI, Deb (Dan) Brunner of Mt. Horeb, WI, Linus Loeffelholz Jr. of New Glarus, WI, Chuck (Andrea) Loeffelholz of Brooklyn, WI, Pam (Clint) Zettle of Brooklyn, WI, Bill Loeffelholz of New Glarus, WI, Becky (Marc) Peterson of Belleville, WI, and Nicholas (Roxie S.) Loeffelholz of Madison, WI. Seventeen grandchildren, and twenty four great grandchildren. He was preceded in death by his parents, his wife Darlene, son Michael, two sisters, two brothers and a son in law Raymond Rankin Sr.
Funeral services will be held at 10:30 A.M. on Thursday, May 5, 2016 at St. Francis of Assisi Catholic Church, 338 S. Harrison St. Belleville, WI with the Rev. Michael Moon officiating with burial in the St. Lawrence O'Toole Cemetery, Mt. Hope, WI. Relatives and friends may call from 5:00 P.M. to 8:00 P.M. on Wednesday, May 4, 2016 at the Becker – Beal Funeral Home, 109 Greenway Cross, Belleville, WI. Paul Loeffelholz was born circa 1925 at Wisconsin. Paul Loeffelholz died after 1972. Name Variation Margaret Ann Loeffelholz was also known as Margarette. Margaret Ann Loeffelholz married Francis Richter. Margaret Ann Loeffelholz was born on 17 October 1928 at Dickeyville, Grant, Wisconsin. She was the daughter of Charles Loeffelholz and Emelia Salzmann. Margaret Ann Loeffelholz died on 31 July 1994 at age 65. She was buried after 31 July 1994 at Immaculate Conception Church Cemetery, Kieler, Grant, Wisconsin. Nickname Francis Richter also went by the name of Bud. Francis Richter married Margaret Ann Loeffelholz, daughter of Charles Loeffelholz and Emelia Salzmann. Francis Richter was born on 25 March 1925. He was buried at Immaculate Conception Church Cemetery, Kieler, Grant, Wisconsin. Name Variation Katie Loeffelholz was also known as Catherina. Name Variation Katie Loeffelholz was also known as Katherine. Name Variation Katie Loeffelholz was also known as Katie. Katie Loeffelholz was born on 26 April 1891 at Paris, Grant, Wisconsin, also reported as 27 Apr 1891. She was the daughter of Michael Loeffelholz and Theresia Dietzel. Katie Loeffelholz died on 1 February 1974 at age 82. Michael Norbert Frank Loeffelholz was born on 6 June 1894 at Minnesota also reported as Jun 1895. Michael Norbert Frank Loeffelholz died on 8 October 1918 at age 24. Name Variation Cecelia T. Loeffelholz was also known as Celia. Cecelia T. Loeffelholz was born on 16 November 1895 at Minnesota also reported as Nov 1896. Cecelia T. Loeffelholz died on 13 November 1918 at age 22.